What should you include in your food stockpile, be it for survival or for the winter? A very good question. You want the food to be healthy and feed your family and you don’t know exactly what the emergency may be so you have to plan ahead. In a medium or long-term survival situation, you may not have running water, electricity, or a means to cook and prepare the food if you haven’t planned ahead. In our area we often get blizzards and are snowed in for a few days to occasionally a week or more. One important factor to consider is that you’re going to want to make sure that the foods that you select for your stockpile are foods that will last. When properly stored, many may last as long as 20 years and still retain their nutritional value and taste. It’s also important to note that not all food that is labeled “Survival Food” will work for your particular situation. Some foods will have an overabundance of such ingredients as corn syrup which has actually been banned in many countries. You also want to make sure that there isn’t too much sugar in your survival foods as this won’t be as full of nutrition (although it may enhance the flavor). Keep in mind also that there are many “weeds” that are edible. The lowly dandelion is a prime example of an edible weed. You can use the root to make tea, the greens for salads, and the flowers in a variety of healthy recipes. Take a look around you before winter hits and see what weeds you could be storing as well. 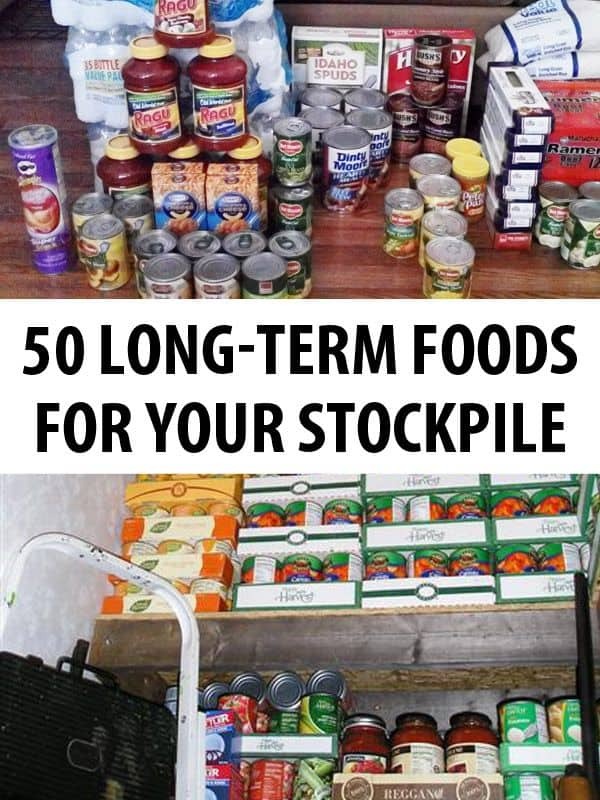 There are different types of foods that you can store in your stockpile. These include dehydrated foods, freeze-dried foods, powdered foods that are reconstituted with water or other liquids, canned fruits or vegetables, canned meats, dried foods such as beans or pasta or rice, and condiments. Most people choose to store a variety of foods and use all of the above in their stockpile. Apple Cider Vinegar: Along with many health benefits, this is also very versatile and you can use it for a variety of purposes from cleaning to adding to cooking to prevention of viruses. Make sure to get the organic version that has the “mother” intact for the most health benefits. Applesauce: You can use applesauce over your pancakes, waffles, alone as a dessert, as a side dish, as a replacement for oils in cooking and more. It’s a delicious addition to any meal and has an excellent shelf life. Beans: You can store beans dried or canned. They’re an ideal addition to any meal and add some protein in as well. You can use them as filling, as a side dish and they also have plenty of fiber, carbohydrates, iron and flavor to add to any meal. Bouillon Cubes: Bouillon cubes come in cubes or as a liquid and even as powder. You can add this to soups, stews and more for additional flavor. Choose a variety of flavors for maximum benefits. Biltong: This is a kind of dried and cured meat that originated in South Africa. It’s quite similar to beef jerky, although, it’s much thicker than beef jerky. It is soaked in vinegar that has spices and salt added in and then it’s cured and dreid which gives it texture. Biltong is never smoked like jerky is. Blueberries: Blueberries are full of nutrition and an excellent source of vitamin C as well as fiber. They also have tannins in them. The tannins can help to prevent urinary tract infections and the ellagic acid is believed to aid in the prevention of cancer. The rest of the antioxidants are full of nutrition and health benefits. Blueberries are an ideal dried fruit and the dried blueberries will last for as long as 2 years under proper conditions. They’re ideal on cereal, ice cream, and alone. Broccoli: One of the healthiest vegetables broccoli is full of Vitamin B, vitamin C, Vitamin E, calcium, folate, and potassium. It’s full of antioxidants and works well to help fight diseases. Sadly, it doesn’t have a long shelf life however, it can be dehydrated and used as a powder or re hydrated with water for health benefits. You can also purchase freeze dried broccoli. Carrots: Carrots are full of beta-carotene which is necessary for keeping vision sharp. Carrots can be dehydrated or canned or you can leave them whole and place them in a root cellar. Canned carrots have a long shelf life of approximately 5 years. Canned Soups: We keep a variety of canned soups and canned cream soups on hand. These make for a quick and easy meal and they can be added to other dishes to make a full meal that is hearty and healthy. Canned Tuna: Canned tuna is one of the best survival foods on the market. As a meat product, this can is full of nutrition and ideal for storing for survival food. It can last up to five years under the right conditions (keep cans in a cool dry location and leave them unopened). It’s full of protein and has a lot of nutrients. Available in flaked or solid forms there are a few different varieties to choose from. No survival food stockpile is ready unless there are several cans of tuna in the stockpile. You can also store other canned meats for an emergency situation. Cocoa: In addition to a hot mug of cocoa, you can also use it in baking, add it to dairy products and use it to flavor muffins and more. Cereal: There are many types of cereal on the market today. Many people are stockpiling cereal however, it’s important to keep in mind that it does have a shelf life after which it can become stale. Store it in its original packaging and seal it again in a plastic container with a lid for longer preservation. You can also find hot cereals such as cream of wheat, cream of rice, and more to add to your stockpile. Cereal is filling and healthy and will go well with a lot of different meals. Whole grain cereals will give you more nutrition for your money. Chicken: Canned chicken is ideal for protein. It’s also a good source of niacin, selenium, Vitamin B6, and phosphorus. Canned chicken will last for several years and is an ideal resource for any survival pantry. Coconut Oil: Most oils only have a short shelf life, however, coconut oil has a long shelf life of at least 2 years and is an ideal addition to many foods. You can use it for frying, cooking, baking, and as a skin cream if your skin is dry and itches. Full of plenty of nutrition, this is a great addition to your food pantry. Coffee: If you’re a coffee drinker, you are likely already storing away plenty of your favorite brand. Coffee will give you a boost and it is a very long shelf storage life. It can also be added into cookies, muffins and other baked goods for additional flavor. Cornmeal: Cornmeal is an ideal substitute for flour. It can also be used to make homemade corn tortillas and it doesn’t require yeast to bake with it. It can be used to thicken foods and to make them tastier. Cornstarch: Ideal to thicken soups, gravies, stews, and it also makes foods fluffier as well as heartier. Cornstarch can also be used to wash windows, deodorize your shoes, soothe rashes (including diaper rash), repel insects and more. Corn Syrup: Used as a sugar substitute, corn syrup is banned in some countries however, many are still using it. It works well as a replacement syrup for pancakes and waffles, and for making candy and cookies. Freeze Dried Cheese: While it may not sound appetizing, a container of freeze dried cheese is ideal to put over casseroles, spaghetti and more. A can of this can last as long as 20 years. Ghee: Ghee is very much like butter. When you boil butter and allow all of the moisture to dissipate you have ghee as a result. You can seal it up and keep it in a cool and dry area and store it for a very long time. Green Seaweed: Okay, for some, this is a definite no go, however, it can add in a lot of nutrition including iodine and all of the benefits of green leafy vegetables. You can add it crumbled up to soups or eat it as a snack for health benefits. Caution: It’s very salty! Hard Liquor: There are many uses for hard liquor on the homestead including sterilizing and disinfecting wounds and injuries. It can also ease physical pain. Hard liquor doesn’t go bad even after it’s been opened. Many believe that it can also be used as “trade” with others in a survival situation. Hardtack: Made up of flour and water, this was carried by civil war soldiers. It will keep for decades. Although it is very bland, it forms a dry cracker that will help to make a person feel full and it can be used with other meals to extend the meal. Honey: Discovered in ancient Egyptian pyramids honey can be preserved for a very long time. It will crystallize and you just warm it up and stir it and it will be right back to an edible consistency. Put it on toast, over waffles or pancakes, in oatmeal or cream of wheat or rice cereals for sweetness. It can add calories and sweetness to meals and it can be used in a variety of recipes. Try to get local honey whenever possible as it has many health benefits for survivalists. It can help to prevent allergies if you’re eating local varieties of honey. Jerky: Whether it’s beef, buffalo, deer or any other meat, jerky can give you a quick boost of protein and some energy. 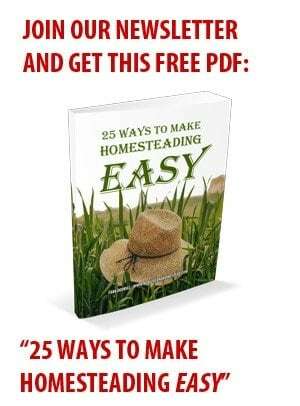 Dry your own, it’s fun and easy and there are a variety of recipes out there. Store cool jerky in a glass jar with a lid and leave it in a cool dry location. Maple Syrup: Just as corn syrup and honey, maple syrup can be used in a variety of recipes including baking and waffles or pancakes. Nuts: Nuts will last a long time if you leave them in their original containers and store them in a cool dry place. Once opened store them in a glass canning jar with the lid on in a cool dark place. Full of essential nutrients including Vitamin E, protein, magnesium, selenium, fatty acids and fiber you’re sure to find a variety of uses for nuts. Choose a variety of nuts or mixed nuts for the most benefits. Ideal as a snack, in recipes, or as a topping for cereals. Oatmeal: Oatmeal is full of nutritional benefits. It’s ideal for nursing mothers to help encourage more milk and it has a very long shelf life. You can use it in cookies or as a cereal or as a filler in baked goods. Dried Oranges: Oranges are full of Vitamin C and they can help to prevent such diseases as scurvy. Dried oranges are an ideal way to make your oranges last for as long as 2 years and can be added to a variety of foods to enhance their nutritional value. You can also use grapefruit, lemons or limes if you’re not fond of oranges. You can also turn dehydrated oranges into a powdered form and make them into a juice. Pasta: After cereal, this is the easiest grain product to stockpile. You can choose from spaghetti, noodles (of every variety) and you can find pasta that is wheat based, corn based, or other vegetable based. It stores forever and is a healthy addition to many meals. Peanut Butter: From no bake cookies to the proverbial peanut butter sandwich, peanut butter has its place in any survival food stockpile. There are so many things that you can do with peanut butter and it’s high in protein and very affordable. Pemmican: Native Americans who had no refrigeration stored their meat by making it into pemmican. They would then store it in leather pouches that helped to keep it fresh. It was ideal as a “fast food”, or when they were out hunting, in battle or otherwise in need of a healthy meal. It’s made from dried pounded meat that is mixed in with fat and other ingredients that they happened to have on hand including berries and spices. Pickles: Pickles can add some zing to any meal. They’re also ideal to add to sandwiches, canned tuna and more. We keep a lot of pickles on hand and even eat them as snacks. Popcorn: Delicious popped up and eaten as a snack. It will store indefinitely. Potatoes: Full of many great nutrients you’ll want to store these in a variety of ways. Store some in the root cellar, can them, store them dehydrated and you can even cook them up and freeze them as mashed potatoes. Potatoes are a valuable source of protein, carbohydrates and they have many essential vitamins. Potato flakes can last as long as 15 years if you’ve purchased them commercially. Powdered Drink Mixes: Powdered drink mixes like tang, lemonade, fruit drinks and such are ideal ways to stay hydrated and keep plenty of fresh juice on hand. Many contain added vitamins including Vitamin C.
Powdered Eggs: While there are many studies about how to store fresh eggs, they’re not going to last long unless they’re stored under the right storage conditions. You can however enjoy eggs in powdered form. These will scramble up nicely and they also make nice omelets. You can also use powdered eggs in baking and they’re full of protein. Powdered Milk: Babies survive just fine on a diet of milk for almost a year. Milk has all of the important nutrients required for survival. Powdered milk will store indefinitely and you can also find canned milk as well. It’s full of calcium, Vitamin B, protein, phosphorous and iodine. If you store your powdered milk in a glass or airtight plastic container it can last as long as 10 years. Protein Bars: Full of protein you can either make your own or purchase them ready made. They’re delicious and easy to store when you store them properly. Ramen Noodles: While we all know that these aren’t overly nutritious, they can make a great soup base and a quick meal if you’re on the run and need something fast. They’re cheap and you can add mixed veggies to them and more. Ramen noodles have a long shelf life and have long been a college student staple for late night studies. They’ll at least add some variety to your emergency food supply. Raisins: Along with the dried blueberries you stored in your stockpile above, raisins are easy to store and very nutritious. They’re full of vitamins and minerals and will last for several years. You can add them to baked goods, oatmeal or other cooked cereals, regular cereal, and eat them as a snack. Rice: In many countries, rice is their main food source. Rice is a grain that is full of nutrition and makes a variety of meals that are healthy. It can also be made into a “pudding” that is a delicious taste treat. It’s easy to store as long as it’s kept in a cool dry location and you can store it in jars, or plastic containers. Salt: Although this is a spice or seasoning, it has a variety of uses in a survival situation. It can be used to make food taste better, it can be used to cure meat (and turn it into jerky), it can be used to ease sinus congestion, and even for cleaning. Sauces: We’ve combined this one to include such things as mayonnaise, mustard, hot sauce, salsa, ketchup, barbeque sauce and the like. We keep a variety of these on hand in our pantry and I always stock up when I find them on sale. They can jazz up any meal and turn a ho-hum survival meal into something spectacular. Stock up on what your family uses the most. Soy Sauce: Soy sauce is a salty seasoning that can add flavor to foods and turn a boring dish into something spectacular. We keep several bottles of this on hand for just this reason. It’s full of sodium so use it sparingly. Sugar: On our homestead, we have a lot of white sugar, brown sugar, and powdered sugar stored away. We use it in a variety of dishes and drink mixes and it adds sweetness and flavor to our meals. It’s also ideal for baking. Sugar will store indefinitely as long as it’s in a sealed plastic or glass container. We like gallon glass jars for this purpose. Tea: Tea is a nice beverage hot or iced. The tannin in the tea bags can also be helpful for a toothache and to stop bleeding. Tomatoes: Canned tomatoes have a long shelf life. You can also run them through a blender and have tomato sauce which can be used in recipes as well. If you’re looking for a great versatile food, this is one that you must have on your list. Tomatoes are full of Vitamin A and Vitamin C, antioxidants, fiber, and potassium. Vanilla Extract: Vanilla extract will add flavor to your foods and if you buy the real stuff which is made from alcohol, it’s only going to improve with age. White Vinegar: Ideal in cooking and it stores indefinitely. It is also great for cleaning and disinfecting any surface. In addition to the above mentioned foods, we also keep fresh spices and seasonings on hand. We grow a lot of our own herbs and dry them for future use. We store these in small glass jars and when those are full we store the remainder in larger glass jars. They store indefinitely and add delicious flavor to all of our meals. We also store water in glass jars and plastic jugs. We also have water purification tablets that we keep on hand and a water filtration method that we have as a backup should we run out of those. Water is necessary for survival, and we strive to have at least a gallon of water per day per person and plenty for our animals as well.